Android introduced Toolbar with the release of new operating system Android Lollipop (API 21). Toolbar has replaced the Android Action Bar and we can use it anywhere in our application. Toolbar was introduced in android API 21 (Lollipop 5.0) however we will be able to use this in devices below API 21 also by using appcompact support library. Why Toolbar instead of ActionBar? Toolbar provides us lots of attributes and we can customize it in our own way than ActionBar. Now we can view multiple toolbars within the screen. 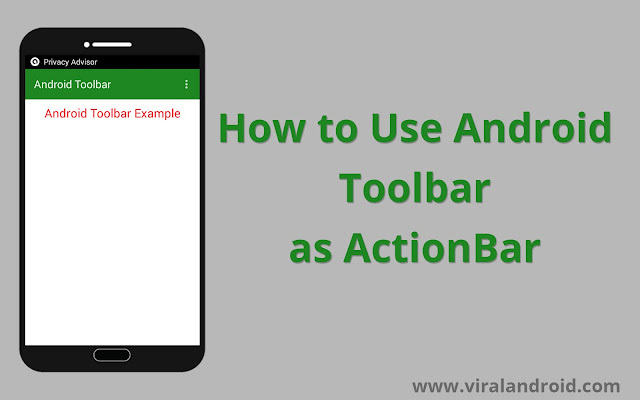 Just follow the following steps to use Toolbar instead Action Bar. You have to add appcompact support library as a dependency in your build.gradle file before jumping to our coding part. Just add compile 'com.android.support:appcompat-v7:22.2.0' in your build.gradle file inside dependencies. To use Toolbar as ActionBar you have to use Theme.AppCompact theme, just use Theme.AppCompact.NoActionBar as parent theme. Now you need to add Toolbar to your XML layout. Use the code given below to use Toolbar as Actionbar. Finally, we have to add two lines of code in our java Activity. That's all, now run your Toolbar Example application.